Narendra Modi is the first mainstream Indian politician who has tried to build his image rather assiduously. But the acceptance of an award with dubious connections does not add to the glory of the Prime Minister’s post. Narendra Modi, the present incumbent to the Prime Minister’s chair, had a little break the other day for an award ceremony. 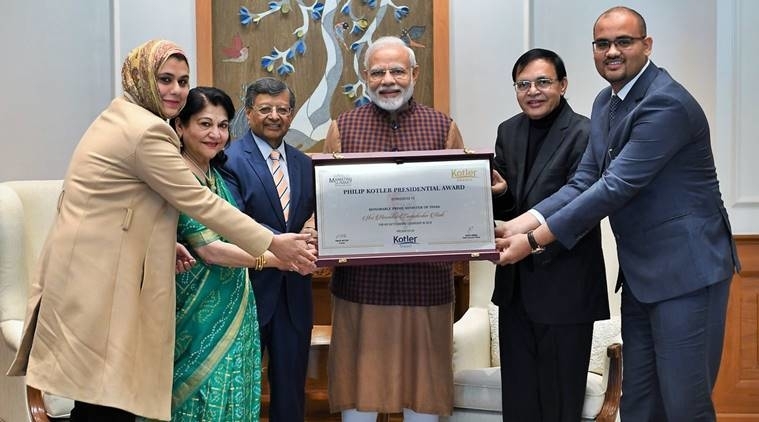 Well, little different from the usual award ceremonies — where the Prime Minister presents awards and gives some pep talk, here Modi himself was presented with the ’First-ever Philip Kotler Award’. Perhaps looking at Modi’s much-publicised workaholic nature (if one is to believe what is written about him, he is reported to work 18 hours a day without any break) the organisers had seen to it that people who were to be presenting the award were flown in to save his time. As expected, not only the bhakts but many of Modi’s cabinet colleagues could not hide their glee with this ‘first-ever’ award and went on overdrive to shower praise on him. Soon it dawned upon them that (thanks to The Wire report, which merely posed a few basic questions about this award) there was not much to be elated over this award, so they preferred to suddenly turn mute.